Republic Day honors the date on which the Constitution of India came into force on 26 January 1950 as the governing document of India. 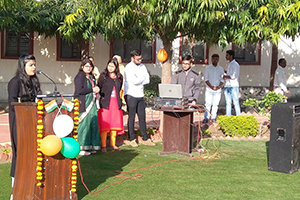 To commemorate the same, alike every year, Republic day was celebrated in the RIET campus on 26.01.19. 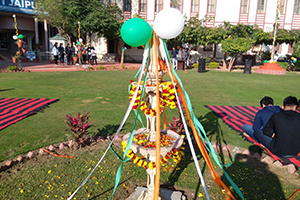 The celebrations took place in the Mini-lawn which was decorated with tricolor festoons and flags. 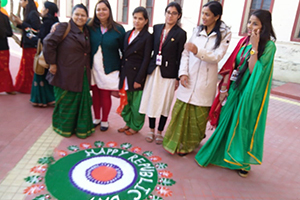 Beautiful rangoli was created on the entrance floor by the students. The flag hoisting ceremony took place at the appointed hour. 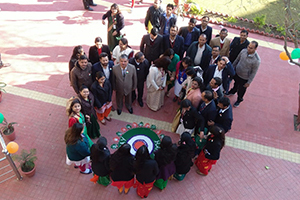 All the faculty members, staff and students assembled to celebrate the function. 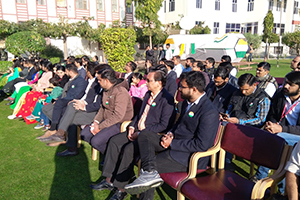 Dr Saroj Hiranwal, Principal RIET, Prof. Kapil Dev Sharma, Dean Academics & Admin, RIET, Dr. Sachin Sharma, Vice Principal, RIET & Prof D D Johari, Advisor T&P, along with all the respective HODs unfurled the flag, and the National Anthem was sung in unison by the entire audience. Dr Saroj Hiranwal, Principal RIET addressed the audience with her words of encouragement. She inspired all the students to carry out their duties and responsibilities with sincerity and dedication. 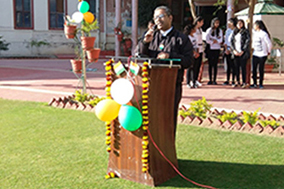 Prof. Kapil Dev Sharma, Dean Academics & Admin, RIET, and Prof D D Johari, Advisor T&P, also spoke a few words of inspiration and wisdom to all the students and faculty members on the occasion. 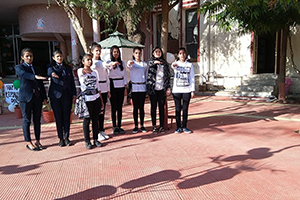 Students put up a beautiful self composed poems, dance and Patriotic songs to honor the occasion. 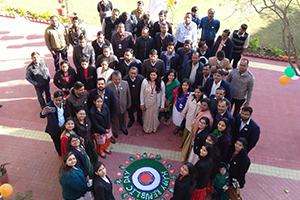 The event was celebrated with great enthusiasm by all the Faculty members, Staff and the students of RIET. The concluding note on this day was given by event coordinator RIET, Ms Jyoti Khandelwal, Asst Prof, department of CSE. She urged all the students to put in their wholehearted participation in the events of the organization. The day ended with hails to “Mother India”. Sweets were distributed to all present.